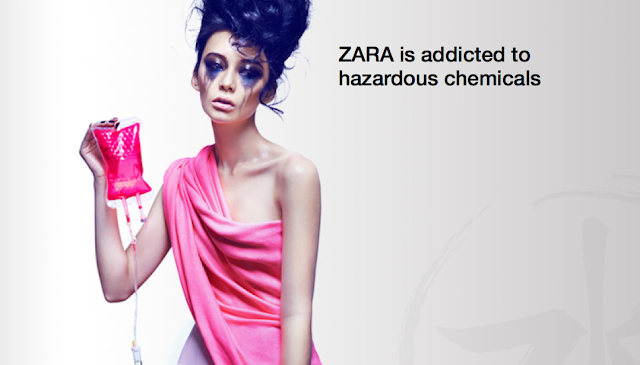 Help Put an End to Toxic, Hormone Disrupting Fashion! I have written many times about fashion's dirty little chemical secret and finally we are making progress in outing them and creating significant change for the planet and our health. For the last few months, Greenpeace has been conducting research into many of the world’s top clothing brands and what they have found has been disturbing to say the least. The news from Greenpeace is that ZARA, the world's largest fashion retailer along with several other retailers, is polluting waters in China with hazardous, hormone disrupting and cancer causing chemicals and we need to take action now to put an end to toxic fashion! You might think that what happens in China has no impact on you but guess what? You are just as much a fashion victim as those living in China. Those hazardous, hormone disrupting and cancer causing chemicals used in China during manufacturing then wash into our waters when we rinse our clothes. Most of the fashion industry is treating public waterways like its own private sewers and it is time to take action to put an end to the polluting. It’s time we eliminate cancer causing and hormone-disrupting chemicals from the world’s waters before it’s too late. Greenpeace is challenging some of the most popular clothing brands to eliminate toxic chemicals from its process by 2020 — and they need our help. Brands like H&M and British retailer Marks & Spencer are on board and have committed to eliminating all toxic chemicals from its supply chain and products by 2020. Sadly, Zara, one of the world's biggest fashion retailers is not on board. Zara is a trendsetter in fashion and keeps a close watch on the buzz about its brand so it is time to make them understand how much consumers care about non-toxic fashion. If we make enough noise, this is one trend Zara won't be able to ignore and one that will catch on with other fashion manufacturers. As consumers your voice is critical to convincing ZARA and other companies to do the right thing. If this huge fashion company responds, the rest of the industry could follow, so it’s urgent we act now. If 40,000 of us send a message to ZARA in the next 48 hours it will encourage the company to take the pledge to detox its clothing and stop the use of hazardous, hormone disrupting chemicals. We Don't Need to Be Fashion Victims! We know this fashion clean up can be done but we really need your help. In fact, thanks to consumers like you, the Greenpeace detox campaign secured commitments from Adidas, Puma and other sports apparel makers to clean up their practices and detox their line by 2020. 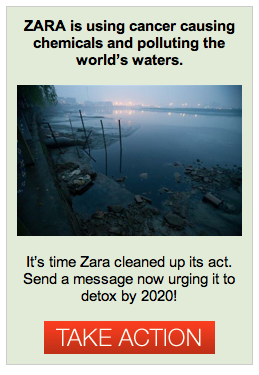 Stop being fashion victims and reach out to ZARA right now with an urgent message to clean up its practices and detox today. Your voice matters and can make a difference to the entire world. You hold the power...exert it now!